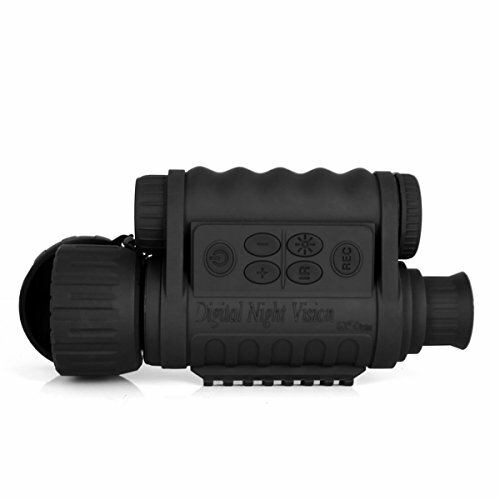 Outstanding optical clarity, high performance night vision. With Camera & Camcorder Function. It can be used as telescope or camera and video, low light environment distance is infinity and 350M on full dark environment. Multi HD portable infrared remote monitor imaging system, it suitable for indoors and outdoors. Offers 6x optical magnification, 1-5x digital zoom and a 50mm objective lens. It be a live Infrared surveillance camera connecting TV with TV cable and connecting Computer with USB cable. Photo: 2592*1944 pixel,1600*1200pixel,640*480pixel; Video:1280*720pixel @30 fps 640*480pixel @30 fps; Date and time could be stampted on photo or video. Built-in 1.5-inch color LCD screen and HD 720P video recording, also built in Infrared Illuminator for up to a 1150 ft/350m viewing distance. Day or night use(with IR off for daytime color); With Portable strap(removable), easy for hold. Long life, large magnification and lens imaging system, it also can shows on your PC screen in real-time when you observing something.Note:To avoid quick batteries consumption, please use alkaline batteries, DO NOT use Zinc-carbon batteries or Ni-MH batteries; we recommend Energizer or Duracell alkaline batteries.